It’s no secret that the airlines’ strategy for surviving the current profit crunch depends almost entirely on what the airlines call service or convenience [[Airline Fees | fees]]—what consumers are more likely to refer to as nuisance fees or nickel-and-diming. By whatever name, they’re new and higher charges for services which traditionally have been offered on a no-cost basis. And it’s not just soft drinks, aisle seats, and checked bags that now have travelers reaching for their wallets. Almost every aspect of frequent flyer programs has been newly reimagined as a revenue-generator, with program members facing fees at every step in the process. Once upon a time, the reward for earning 25,000 frequent flyer miles was a free ticket—a really, truly free ticket. Now, in the programs of two airlines, there’s simply no such thing as a free ticket. Having paid once to earn the miles, travelers are being asked to pay yet again to use them. [% 2620998 | | American %] in June began charging a minimum of $5 for any and all award tickets in AAdvantage, the world’s largest mileage program. And earlier this month, [% 2616921 | | US Airways %] imposed award ticket fees ranging between $25 and $50. A fuel surcharge can be thought of as a ticketing fee that has been imposed specifically to offset a temporary spike in fuel costs, and might therefore be lowered or withdrawn altogether when fuel prices moderate. [% 2624314 | | Delta %] and Northwest both have, or will have, such surcharges in place. Delta now charges $25 for domestic award tickets, $50 for international. And as of September 15, Northwest will charge between $25 and $100, depending on the flight distance. While these surcharges may theoretically be of limited duration, they negate for now the possibility of a truly free ticket just as categorically as do permanent ticketing fees. Before there were award ticketing fees, there were fees for booking trips by phone, or at an airline’s ticket counter. Such booking fees have been doubly rewarding for the airlines. First, the fees generate extra cash. And second, they lower the airlines’ operating costs by discouraging travelers from engaging in labor-intensive transactions and directing them toward the carriers’ own websites, where reservations and other services are automated and cheap to perform. Where applicable, booking fees apply to reservations for both revenue and mileage-based reservations. For paid trips, booking online generally presents no great challenge to any consumer with basic computer skills, so it’s a simple matter to avoid the fees by going the do-it-yourself route. But for award reservations, where seats available for mileage redemption are limited, there is considerable pressure to take advantage of a reservations agent’s expertise in navigating among the restrictions to create a viable itinerary. In other words, the airlines have created a bottleneck, and then charge consumers who need assistance in bypassing the restrictions. Create a problem, then sell the solution to that problem—an ingeniously diabolical business model seemingly designed to generate as much ill will as profit. As they do elsewhere, the discount carriers have bragging rights in this area, with Southwest and Spirit offering phone bookings for free, and AirTran and JetBlue charging just $10. Highest is US Airways, at $30 for domestic award bookings, and $40 for international. Most other carriers charge $25 for phone bookings. Rush fees trace their roots to the days when paper tickets were the norm, and tickets issued within a few days of the departure date had to be priority-processed and sent by courier service to the traveler. The airline passed those extra costs along to the traveler, and called it a rush fee. Today, with almost all tickets being issued electronically and sent via email, the rationale for assessing rush charges has disappeared. But the fees themselves not only persist, they have been rising. American and United both charge between $50 and $100, depending on how close to the departure date the award tickets are requested. Continental and Delta split the difference, at $75. And AirTran, Alaska, Frontier, Hawaiian, Southwest, and Spirit have no rush fees at all. American already charges a $300 cash co-payment in addition to miles for upgrades from discounted coach on international flights. Beginning in October, AAdvantage members will also be hit with a $50 fee, in addition to paying 15,000 miles, when upgrading on domestic flights. And the existing $300 international upgrade fee will rise to $350. That means that the popular round-trip domestic upgrade from discounted coach will cost $100 plus 30,000 miles. And on most international routes, an upgrade will cost $700 and 50,000 miles. Continental also collects cash payments together with miles for international upgrades from discounted coach, from $100 to $500 each way, depending on how steeply the coach ticket is discounted. Plans altered? Need to change your ticket? It could cost you as much as $250 if it’s an award ticket on US Airways. American, Continental, and United all charge $150. There are at least a dozen categories of fees which one or more airlines assess for services related to their loyalty programs, all of which are depicted on [% 2642212 | | this chart %]. 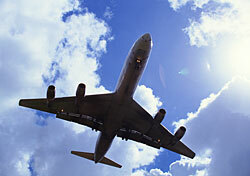 As a group, the discount carriers are much less likely to charge frequent flyer fees. And when they do, the fees tend to be lower. Among the legacy carriers, the worst of the worst is clearly US Airways, which stands out for both more and higher fees than its peers. That doesn’t mean frequent flyers affiliated with more costly programs should shred their membership cards. While less costly, the discount airlines’ loyalty schemes are much less robust, offering many fewer options for earning and redeeming miles. Fees aren’t the whole story. But they can be useful as tiebreakers when choosing among programs that would otherwise meet a traveler’s needs. Rather than trying to grasp the entire fee picture, consumers are best served by focusing on those fees most likely to affect them, given their individual travel patterns and reward goals. For example, travelers who principally use miles for upgrades from discounted coach will find that the upgrade co-payment schemes of American and Continental seriously erode the value of those programs. One alternative might be the program of Delta or United, which offers similarly extensive route networks, but doesn’t charge upgrade co-payments. Except for the fuel surcharges imposed by Delta and Northwest, which may eventually be rescinded or at least lowered, most other frequent flyer fees almost certainly will remain in place indefinitely, no matter what direction the price of oil moves. In fact, even as oil prices have eased in recent weeks, the steady flow of new fee announcements has continued. The cost to travelers goes beyond the purely financial. As fees have proliferated, simplicity and consistency have been sacrificed, adding extra confusion and frustration to the growing list of flyers’ gripes. So numerous and complicated have the fees become that the airlines themselves can’t keep track of them—a fact which became strikingly apparent in the course of researching fees for this column. In one representative case, two airline employees provided conflicting information, which in turn was inconsistent with the rules posted on that carrier’s own website. There’s a straightforward way to quickly restore the programs’ lost value, as well as their simplicity and consistency: Declare mileage programs fee-free zones. That, come to think of it, might also be a fitting reward for frequent flyers’ loyalty.